Supporting Olympians in giving back to their sporting communities, the World Academy of Sport (WAoS) and the GB Olympians have teamed up to train Olympians to become assessors of its Athlete Friendly Education Centre (AFEC) initiative. Chair of the GB Olympians, Joslyn Hoyte-Smith commented “we have been working hard in recent years to allow Olympians to come together and give back to the communities that supported them on their journey to the Games. Activities such as the World Fit pilot scheme and Olympians’ involvement in the Westminster Mile have created opportunities for Olympians to come together and activate the opportunities for such a positive group of individuals. Focussed on those schools which actively support high performing student athletes, the AFEC initiative provides an internationally recognised accreditation framework. The accreditation looks at areas within the school that can best support student-athletes such as the policies and procedures of the school, its overall structure, who provides support and what support is provided to student-athletes along with other areas such as facilities and its connections to the broader sporting community. 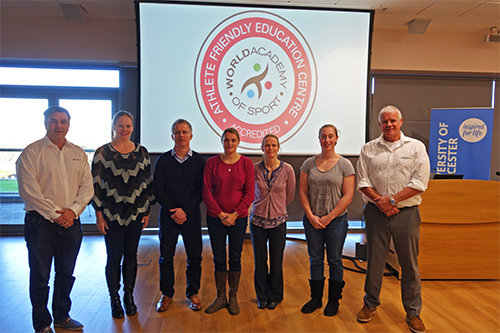 An AFEC Assessors Course was delivered over two days from 23 to 25 November hosted at the University of Worcester for five interested and enthusiastic Olympians. They represent a diverse range of both summer and winter sports and attended Games from as early as 1992 right through to as recently as 2012. Each of the delegates could recognise and often identify with the challenge that AFEC is looking to address with schools and the education system. The Course put the Olympians through the paces with plenty of role play and real life assessment situations. A penultimate part of the course saw the Olympians interviewing staff and students of the University of Worcester in order to make objective assessments and recommendations. These activities were all overseen, reviewed and equally assessed by AFEC Educators. Pleasingly all delegates made it through this first stage training and are now able to participate in AFEC Assessment teams in the field as they go out and apply their learnings in practice. Further information about AFEC can be found here or by contacting Anne Louise Williams awilliams@worldacademysport.com.